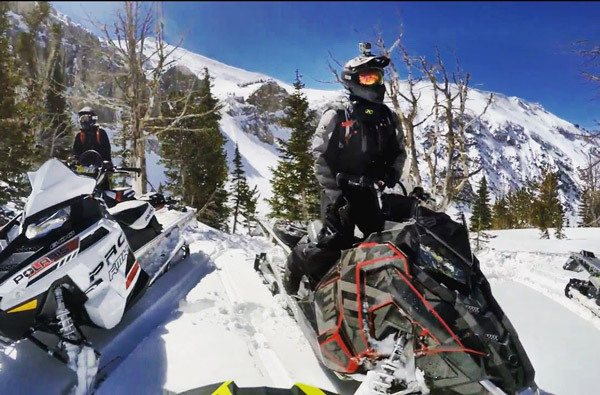 Are you looking for ways to make your snowmobile pop this season? You probably already know then that snowmobile wraps are the way to level up your sled game! 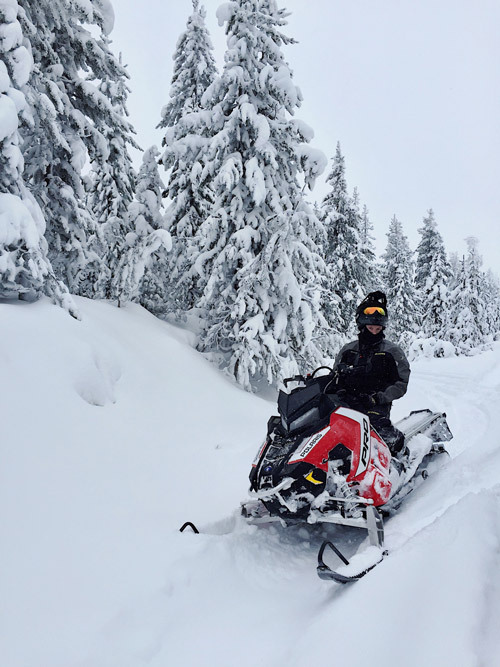 In this post I’ll share 5 reasons (and benefits) for you to consider when thinking about getting your snowmobile wrapped. The feeling of purchasing or acquiring something new is a feeling that never gets old. The rewards of owning something new is that in most cases it moves you to action. Think about it. Are you struggling to find the motivation to workout? Buy yourself a new pair of running shoes or workout shirt. 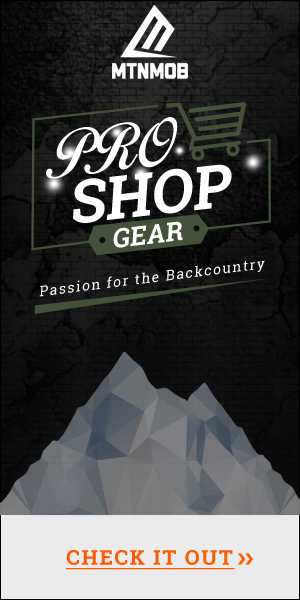 You’ll find a new motivation to get out and try the new gear. Giving your sled a new look with a snowmobile wrap has the same effect. 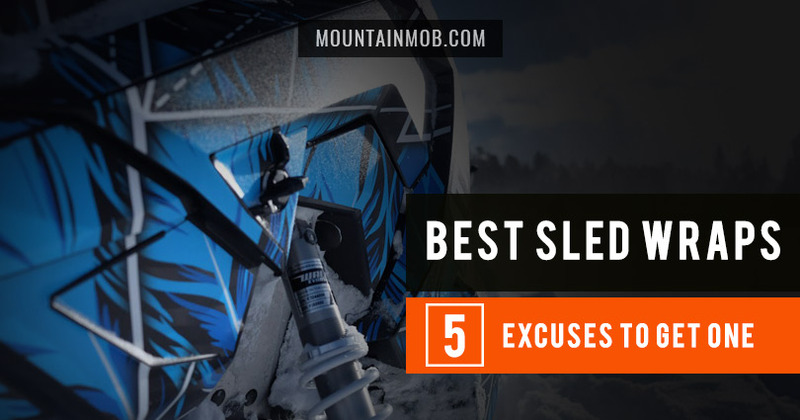 You’ll find yourself more motivated to get out on the sled. I had an old baseball coach once say you play the way you look. If you show up in scrubs for uniforms, your mindset is that your just a scrubby player. If you show up to the field looking sharp, you’ll end up playing at a higher level. So, if you want to step your sled game up, treat your sled to an upgraded look. If you’re like me and find yourself hustlin’ trees usually as a consequence of running out of talent…:-) then you’re used to your sled having scratch marks all over the hard plastic front and side panels. Keep your sled for a few years and those scratches start adding up and make your sled look like it was stored downwind of the outhouse. This doesn’t happen with a sled wrap. Branches tend not to dig in as much and just brush right off instead of sticking and digging in. Last season I slammed my knee into my knee panel hard enough to think I had shattered my knee cap (even with my Klim Storm bibs on). After I properly assessed the situation and realized my knee wasn’t completely done for I noticed the mark left from where my knee slammed in. The sled wrap had some crack marks in it similar to a spider web that was hardly noticeable, but the hard plastic was perfectly fine. I have to believe that without the wrap surely I would have been digging my knee cap out of the plastic panel. Will your wrap get some dings and scraps? It better or you’re not riding hard enough! But, the nice thing is you can fix those each season inexpensively with a new wrap! Yes. Cheap. Upgrade. If you’re digging a new color, or you purchase some new technical riding gear and want to matchy match your colors you can easily do this and not spend the entire family Christmas fund on a new sled, paint job, or panels. You basically get to enjoy the looks of a new sled each year by just swapping out your wrap for a new one. We call her blue dart now and I can honestly say the Natal wrap in this color way has been the best-looking wrap I’ve ever owned. It’s making it hard for me to want to change it up this year! What would you do? Keep the wrap or swap it out this year? Let me know in the comments below! As I mentioned above, look good ride good. Not sure what it is but when you can look at your sled and say that is one bad mother, your confidence soars, you challenge yourself more, usually make more mistakes, but you learn from those and get better. Every year our crew makes the Box Y trip in Wyoming. On our last day I came out of the lodge to see a dude with a professional camera looking all serious snapping photos of Blue Dart. I walked up to him and recognized the dude as Alex Hendy! He recognized the Natal wrap and was drooling over it. He asked if he could snap some shots and of course I said yes. I don’t consider myself as the “mechanical” type but I do like to learn and experience new things. 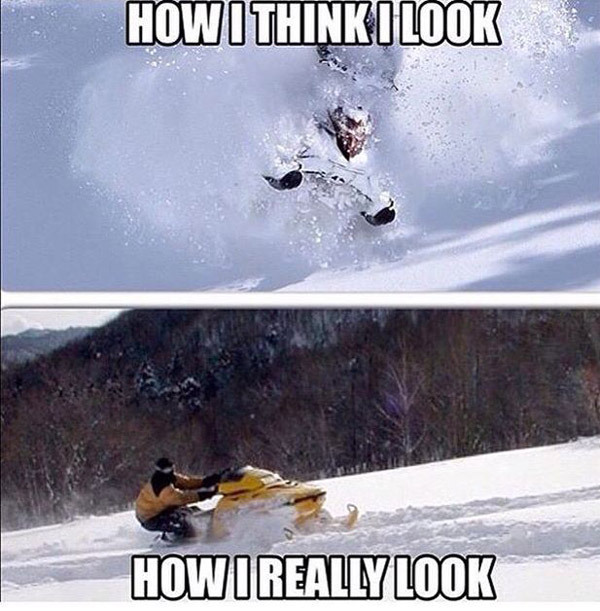 That’s why with my first sled wrap I made the decision to put the wrap on myself. When you get your snowmobile wrap in the mail, it will come on a big sheet that you roll out and each of your decal pieces will be neatly placed on the sheet. This helps you stay organized as the decals should be placed on the sheet in roughly the same proximity of each other once placed on your snowmobile. 1 – It’s extremely possible for a noob to install your own wrap. Because I was a noob and I did it. 2 – I probably will never install my own wrap again. It was too time consuming for me and I was meticulous about not having bubbles. Because of this, I spent many nights after work cranking on it. Yes a stronger bond was built with my sled, but I think I’ll let the pro’s handle that biz next time! 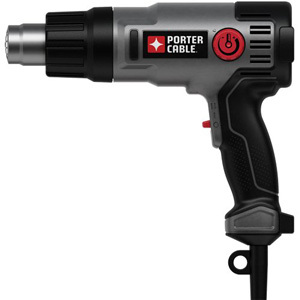 1 – A heat gun. A blow dryer can work as well but not as efficiently. Plus, you can pick up the one below for less than $30 on Amazon. Check it out here. 2 – Squeegee. A safe and convenient way to push the bubbles out. Super cheap on Amazon if you don’t have one handy. Click here to see what Amazon has. That’s really it. Doesn’t take much (besides time!). Designing your own sled wrap from scratch can be difficult and in most cases, results in you probably not ever coming up with that “perfect” design. I personally prefer a solid base that I can work with. The new DeviantInk website allows you to take a design and trick out the color ways to your own liking. The options are essentially limitless to how your sled will turn out when you’re done. 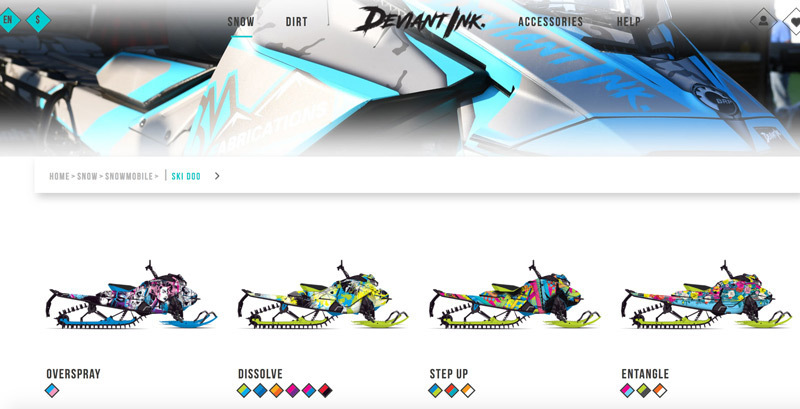 As you’ll see in the video below, the Deviant Ink custom snowmobile wrap generator lets you choose between hundreds of color options to create the cleanest, baddest, most unique sled wrap on the mountain! 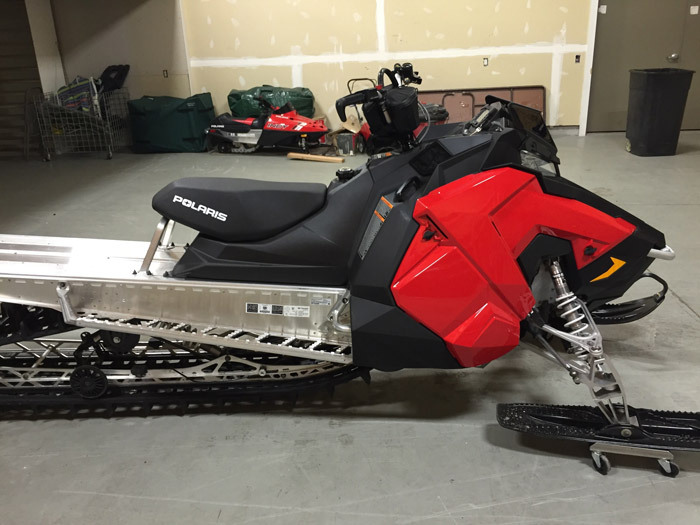 As already mentioned, a snowmobile wrap kit is definitely the way to go when it comes to tricking out your sled. Sure, you could purchase a few stickers and decals to spice things up…I remember…circa 2000 purchasing a custom snowmobile windshield with checkered race flags on the ol’ 500 RMK and thought I was straight ballin. Boy, things have changed! As I’ve mentioned throughout this post, getting a custom snowmobile wrap kit is the easiest way to give your entire snowmobile a makeover. Below you’ll see a few screenshots comparing the various custom sled wraps for Polaris, Arctic Cat, Ski Doo, and Yamaha snowmobile models. DeviantInk has a plethora of Polaris sled wraps for Polaris tunnels, hoods, and full body sled wrap kits! With hundreds of color options and designs, you’ll easily be able to find the perfect snowmobile wrap for your sled! DeviantInk has a plethora of Arctic Cat sled wraps for Arctic Cat tunnels, hoods, and full body sled wrap kits! With hundreds of color options and designs, you’ll easily be able to find the perfect snowmobile wrap for your sled! There are wraps available for all models – m8000, 120’s, etc. 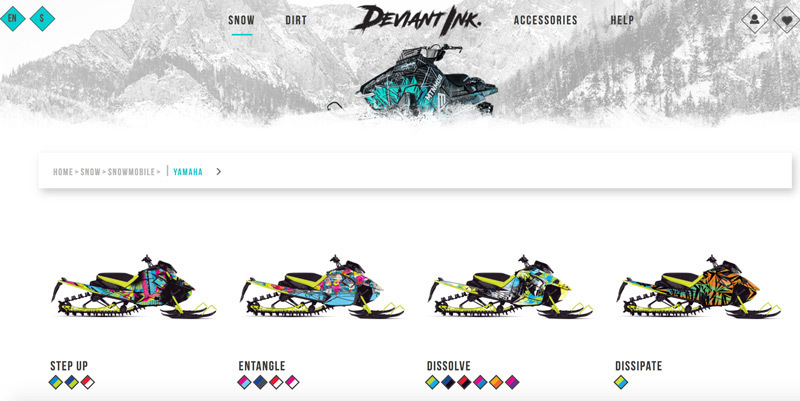 DeviantInk also has a plethora of Ski Doo sled wraps for Ski Doo tunnels, hoods, and full body sled wrap kits! With hundreds of color options and designs, you’ll easily be able to find the perfect snowmobile wrap for your sled! And of course, DeviantInk has a plethora of Yamaha sled wraps for Yamaha tunnels, hoods, and full body sled wrap kits! With hundreds of color options and designs, you’ll easily be able to find the perfect snowmobile wrap for your sled! 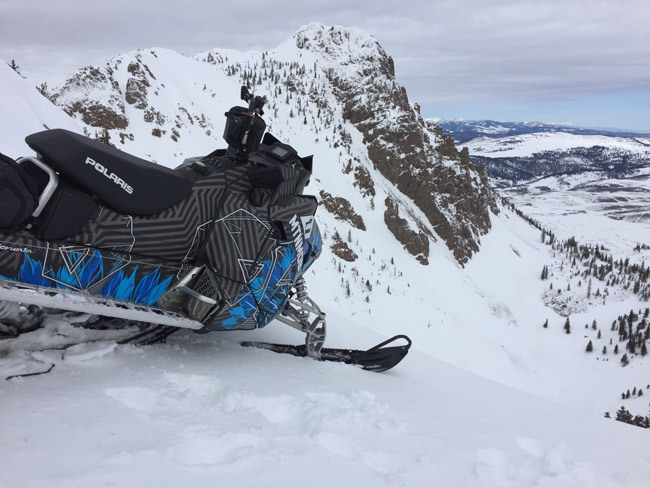 Throughout this blog post I have mentioned the benefits of a custom sled wrap design for your snowmobile. I hope it has been helpful. I’d love to answer any questions you have about a new snowmobile wrap for your sled. Feel free to email GetMtnMob (at) gmail.com or drop me a comment on this post – I’ll answer! As you’ve seen throughout this snowmobile wrap guide, I’ve worked out a 15% discount for you when you use the coupon code MTNMOB on DeviantInk.com. One thing I haven’t mentioned yet is the DeviantInk quality compared to other sled wrap companies… I’ve got a rather large riding group and some of them have wraps from other companies – there’s a noticeable difference in quality when you start comparing Deviant Ink to its competitors. This entry was posted in Snowmobiling. Bookmark the permalink. 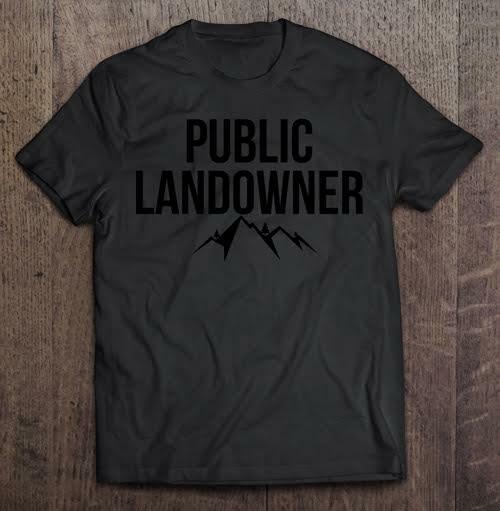 Founder of @MTNMOB - Backcountry enthusiast - Born&Raised IDAHO.